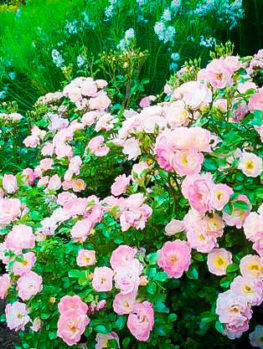 The Pink Drift® Rose is a completely new type of rose, that spreads into a wide mound 3 feet across, but stays low, no more than 18 inches tall. It has deep pink flowers that open wide to show a pale yellow to white center, and the flowers open flat, more like a wild rose. 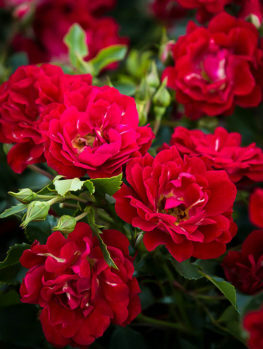 This means that this plant is great to use as a garden shrub in your landscape, not put into a special place as a ‘rose’, needing lots of care and attention. Grow it among your flowers, or smaller bushes. Use a row to edge a bed or run beside a walkway. Plant at the top of a wall to soften the edge and flow downwards in a drift of constant blooms. Did we say constant? Yes, this rose blooms continuously from late spring to frost, producing new sprays of flowers as fast as the older ones fade. You will always have blooms and color from this wonderful plant. 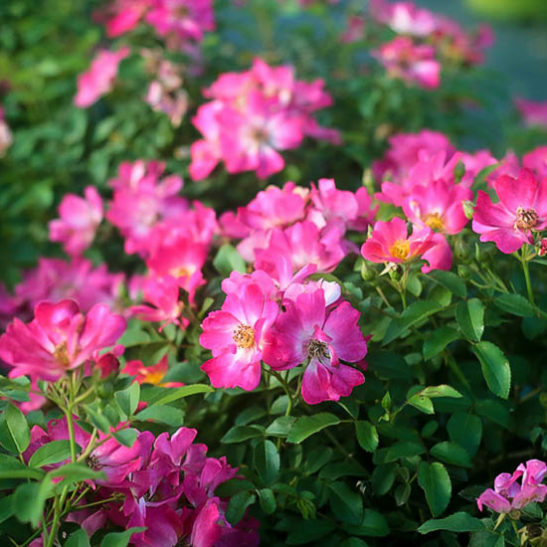 Plant the Pink Drift Rose in a sunny location for continuous blooming and color. It is hardy to zone 4, and needs no winter protection to bounce back into growth in spring. 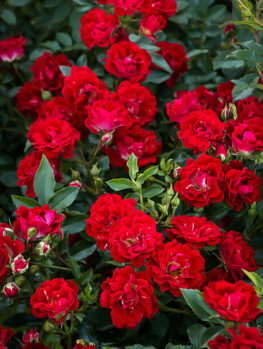 It has been specially-bred by experts to make sure it is resistant to all the major rose diseases, so it needs no spraying to always show you its glossy-green foliage, free of any marks or blemishes. That is of course if you can see the leaves for the profusion of continuous blooms on this great plant. Every garden has a place for a beautiful flowering shrub from spring to fall, and this is the perfect choice for that plant. Most modern gardeners think of roses as something that used to be grown a lot, but that are only grown by dedicated enthusiasts today, because they need so much care and attention. Many people want a natural look in their garden without using plants that need a lot of care. So you might think the Pink Drift Rose is not for you. You are wrong. This plant is not like the roses you have grown before, or seen in other gardens. Some people may not even realize it is a rose, because it looks more like a wild rose, with small, semi-double flowers, each one with about 10 petals. They are born in profusion, in full sprays of many flowers, carried all over the bush from spring to fall. The flowers are a rich, deep pink in the bud, and as they open and become flat, they keep that deep pink color, but the center shows yellow to white, making a striking and interesting color combination. It blooms so profusely you will hardly see the healthy, glossy, rich-green foliage, which is almost a shame, because it is so beautiful. The bush grows just 18 inches tall, so it fits perfectly in the front of a bed, with taller plants behind it. It grows to about 3 feet wide, so each plant covers a good area of ground, and when planted in groups you can quickly fill areas of your garden with flowers for months on end. The ‘wild-rose’ look of the flower means that this shrub fits perfectly into any natural style of gardening, as well as looking great anywhere. Plant some at the top of a wall, where they will spill over and soften the hard edges. Put them into large pots or planter boxes, and they will fill your terrace or balcony with color all season. These are hardy plants, that need no winter protection even in zone 4, where temperatures can be as low as minus 30. The best part of all is that this rose has been bred to be resistant to all the major rose diseases, like Black Spot, Mildew or Rust. So you can forget about spraying or diseases – these plants will be lush, rich-green and healthy throughout the growing season. 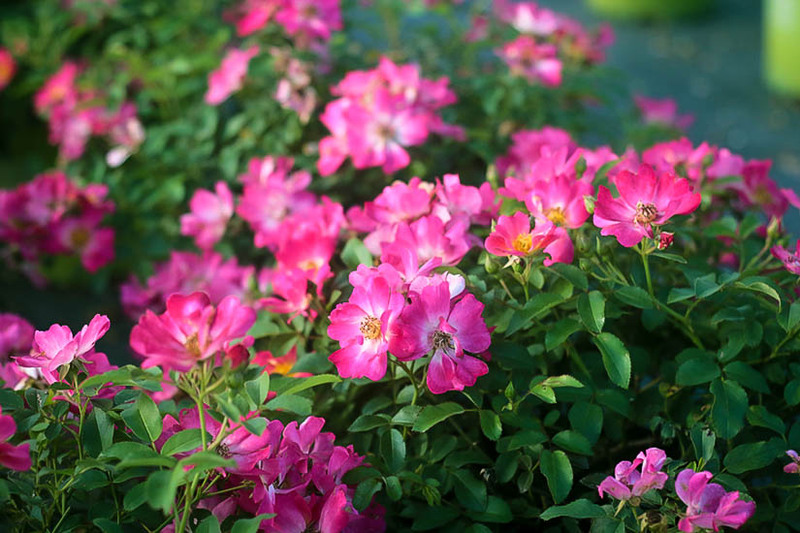 Plant your Pink Drift Roses in a sunny spot, because that sun will help them grow lots of new flowers all season. They will grow in any kind of soil that is not always dry, or always wet. 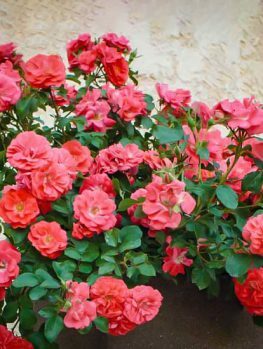 If you have heavier clay soil, then you have good soil for roses, and you will find this plant very easy to grow, and happy with your soil. 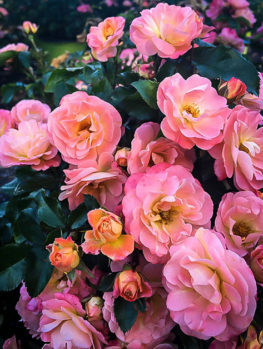 Dig plenty of rich organic material into your chosen area, and use a rose fertilizer regularly, to keep the growth vigorous and the bushes always blooming. Trim your bushes in late winter, by removing some of the thin stems and trimming back old flower heads. Leave the strongest branches, and just shorten them back by a few inches. 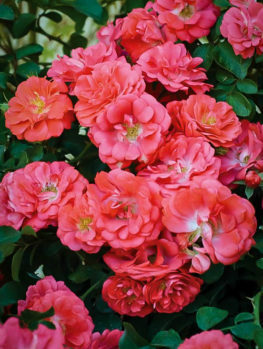 The Pink Drift Rose is one of the best of a new group of roses, called Drift Roses. It was developed in France by the rose-breeder Alain Meilland, from the famous rose-growing family of Meilland. They produced the world’s most famous rose, ‘Peace’, during the German occupation of France in WWII. The breeding of this new rose involved seedlings that had been developed but never released, and a rose called ‘Grouse’. That rose had single flowers with just 5 petals, in a very pale, almost white, shade of pink. 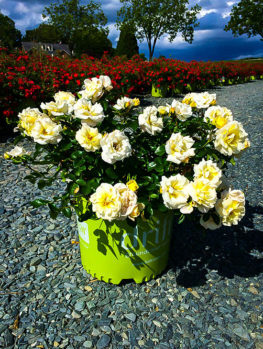 It is a vigorous and healthy rose, bringing good genes to this new variety. 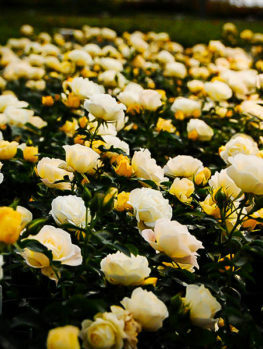 The breeding program focused on creating a rose that was very disease-resistant, and would not need spraying. The goal was also to create roses that kept blooming and blooming, without a lot of special care. 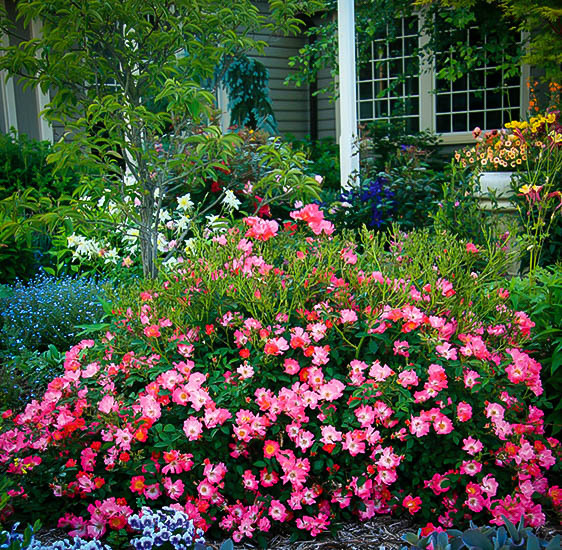 They were certainly successful in that, and you can be sure your bushes will always be full of beautiful blooms. The Pink Drift Rose is a real break-through in easy-care roses, and with its single blossoms it is perfect for natural gardens. We have many customers who love roses, so we know that despite our good supplies, this rose will not be with us long. To grow something new and special, order now or you will have to wait till next year, and that is no fun at all. 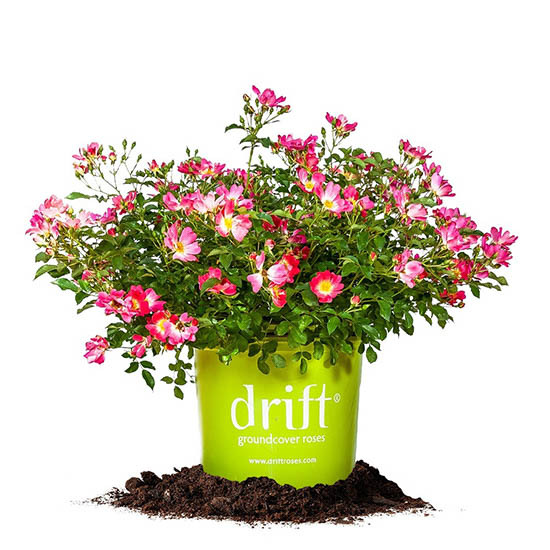 Make sure to also consider some of the other similar varieties from the Drift® series, like the Popcorn Drift Rose and the Red Drift Rose.